These are some easy-peasy tartlets. I made them a while ago actually with some left over puff pastry. Cherry season had just started so I HAD to get some, no idea what I was gonna make with them. I also had some left over marzipan paste, put 2 and 2 together and voilà! The perfect little dessert. The cherry tartlets taste best when served warm, so you can easily prepare them beforehand and just pop them in the oven after dinner. And try them with some almond butter ice cream. Yum! Best served when warm, these Cherry Tartlets with Marzipan make a quick but elegant dessert for two! With a rolling pin, roll out the puff pastry on a floured surface to flatten it out. Cut out two round tartlets: you can use a big round cookie cutter or a bowl of the size of your choice. Divide the marzipan paste in half and form 2 balls, roll them out as thin as possible until they have about the size of your tartlets. Brush the Amaretto on the tartlets and cover them with marzipan. Cut the cherries in half and remove the core. Now place them tightly on the marzipan covered tartlets and sprinkle with sifted icing sugar (depending on how sweet you want them). Bake the tartlets until golden for about 15 min, let cool just a little bit and serve. 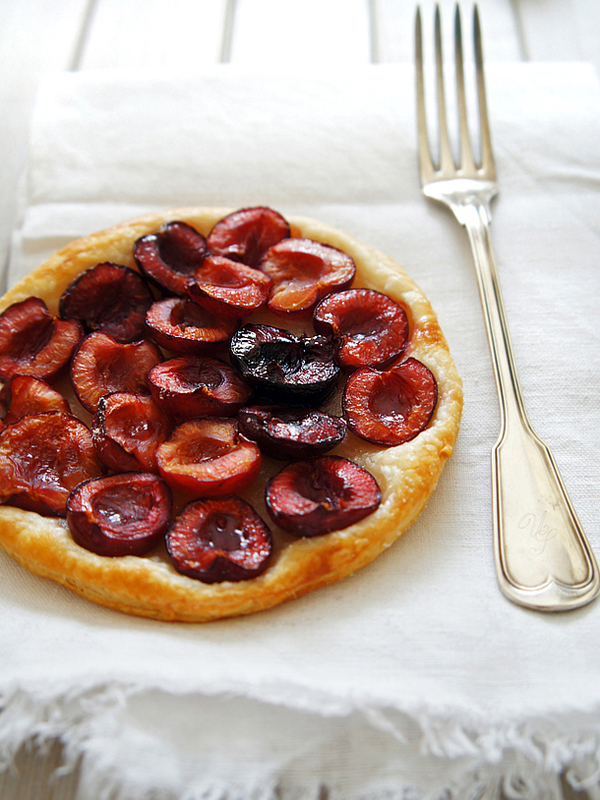 These cherry tartelettes look so gorgeous!